It is nice to be home. I had a lovely trip. This photograph shows the view from 11,000 ft in the Rocky Mountain National Park. 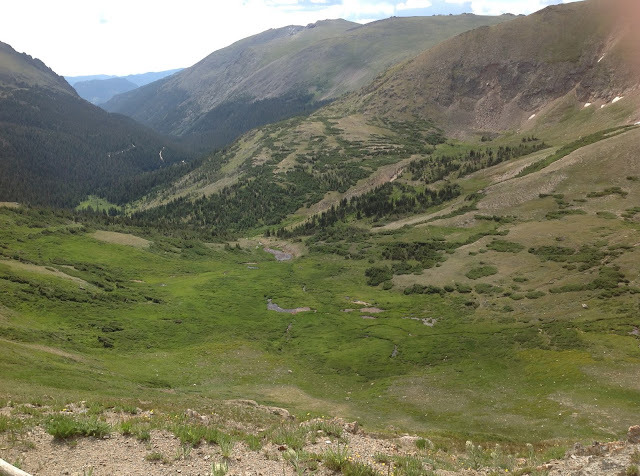 I must admit I do miss the west. Within days of getting home, I had to go up to Ohio for the photo shoot of the Winter issue. We had some lovely garments. They held my Summer Nights sweater for the Winter issue so we shot it again. I wish it looked as good on me as it does on the model! We shoot the Caduceus Coat outside and it was a windy way. When we did the back, a gust of wind caught the bottom and opened it up. I've asked for a copy of the photograph. I'll post it when I get it. Quite a few lessons arrived while I was gone but I managed to get them all reviewed within a day. Several people signed up for courses while I was gone which isn't a problem. I am able to process the orders on my iPad. While I was on my trip someone requested that I do a video for seaming seed stitch. I did an article in Cast On recently on the topic but here we go. The goal when making any vertical seam is to be sure that the stitch pattern continues on either side. 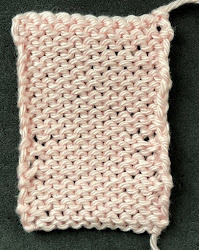 Seed stitch is a good example of this type of seam. 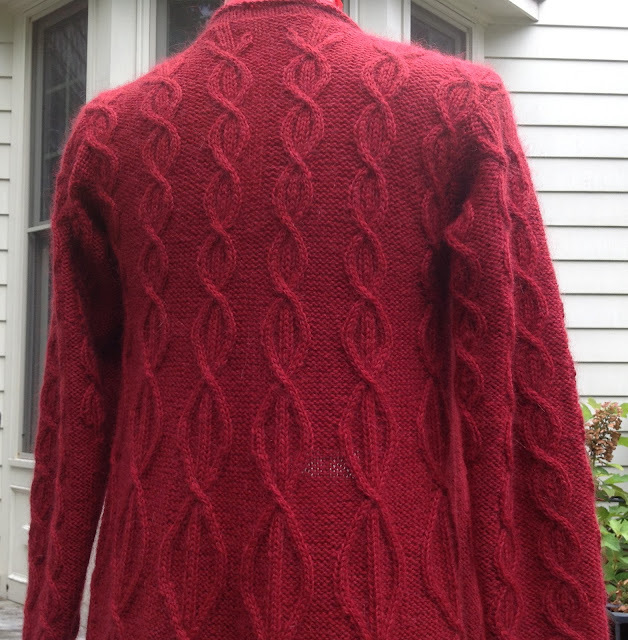 If you are using a pattern which includes a specific stitch pattern, don't assume that the designer has done the work for you. 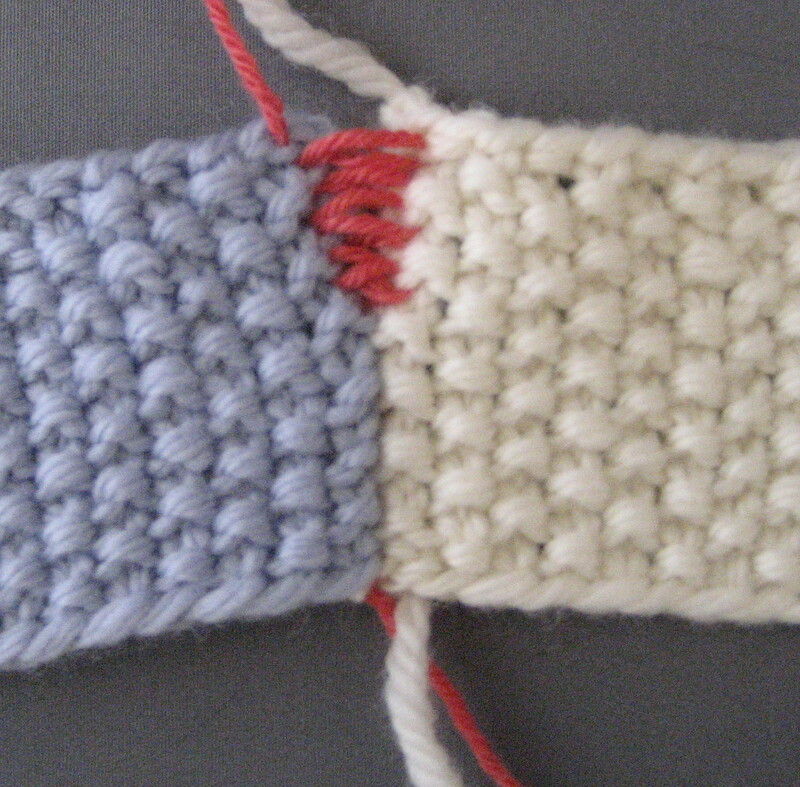 It may be that the stitch patterns line up for one size but not for another. As I am a visual (not a math) person, I generally use graph paper to make sure it will work BEFORE casting on a single stitch. You can't fix this one the pieces are knit. 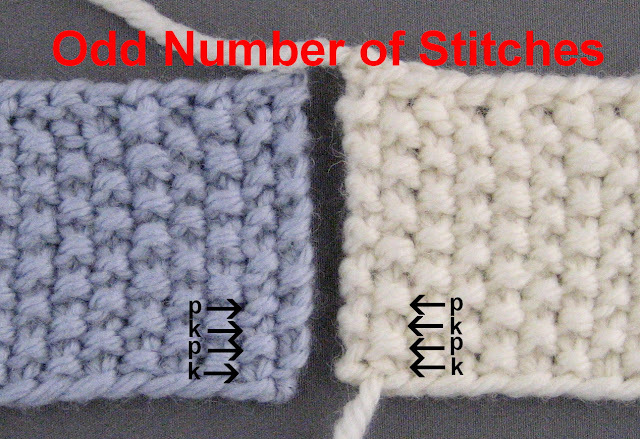 For seed stitch, you can use the mattress stitch if you have an even number of stitches. 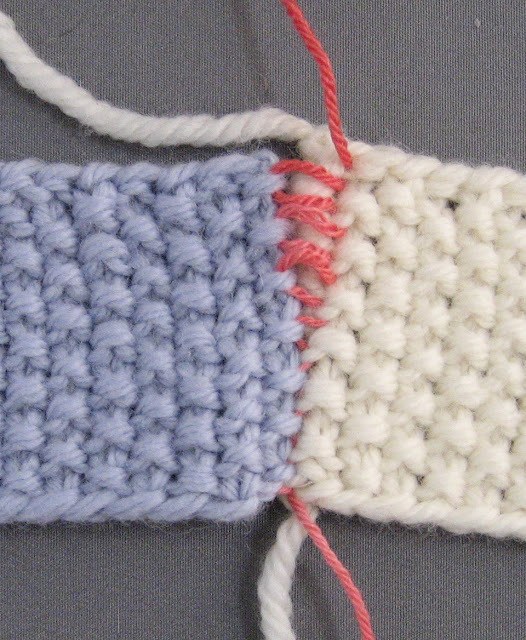 Each piece will begin with a knit stitch and end with a purl stitch. This lines up perfectly for the seam. The mattress stitch uses the horizontal bars between the first column of stitches and the selvedge stitch. This photograph shows the pieces seamed. The pattern is continued over the seam. 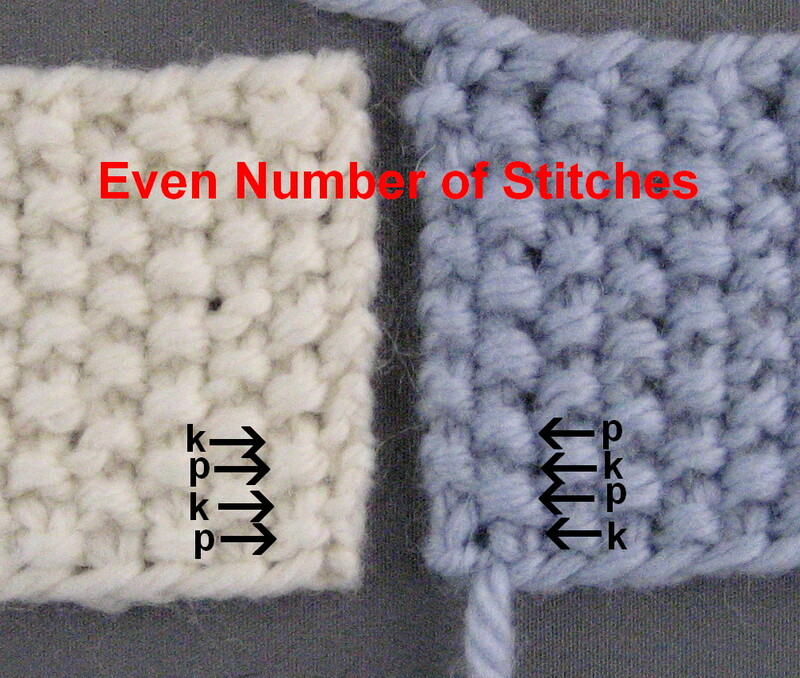 If you have an uneven number of stitches, you cannot use the mattress stitch. Each piece will begin and end with a knit stitch. The mattress stitch was used to seam the piece in the photograph below. Notice that the knit and purl stitches are next to each other disrupting the pattern. If you discover too late that you have an uneven number of stitches, you can use the same technique used for reverse stockinette to seam the pieces. You use the "smile" from one side and the "frown" from the other. 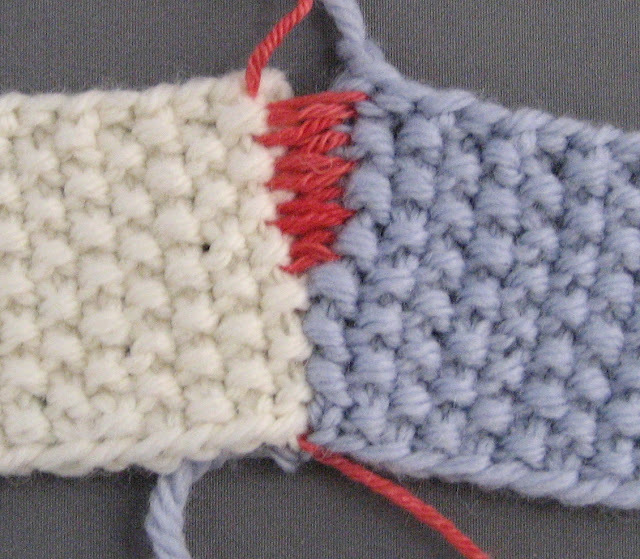 The resulting seam is not as invisible as the mattress stitch. Salon will be on Sunday from 2-5pm. It is the Crochet Tournament at Ashland at that time but somehow I don't think parking will be a problem. 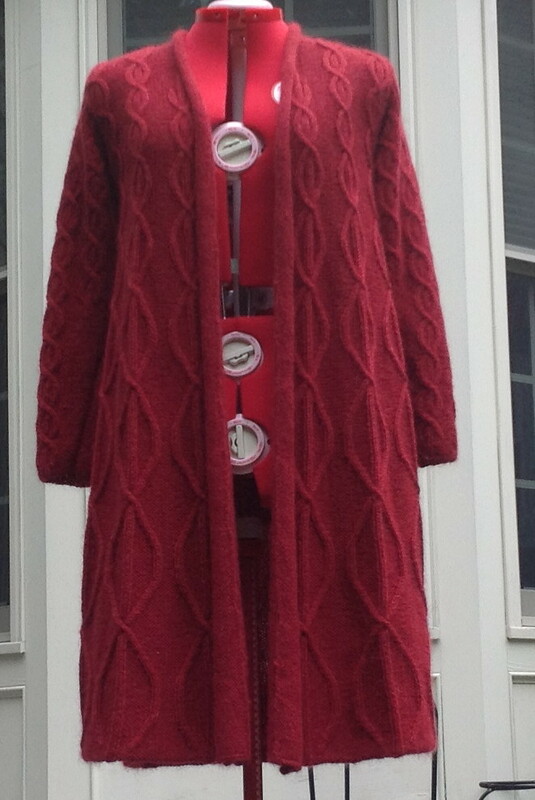 When I got home from my trip I had to put the finishing touches on the Caduceus Coat. I didn't take it with me as it is a bit bulky. I've never been a fan of steaming knitwear as I had only done it with a steam iron. I had mixed results. Suzanne convinced me a steamer is quite useful for finishing touches. I got one before I went to Indianapolis and I am a believer now. I will still wet block pieces but I used the steamer on the seams and the rolls in the front. I took the collegiate hat kits with me on the trip. It was quite an experience. I haven't used a pattern in about 20 years. I am happy to report these patterns are well written. I didn't have time to get to the mittens. 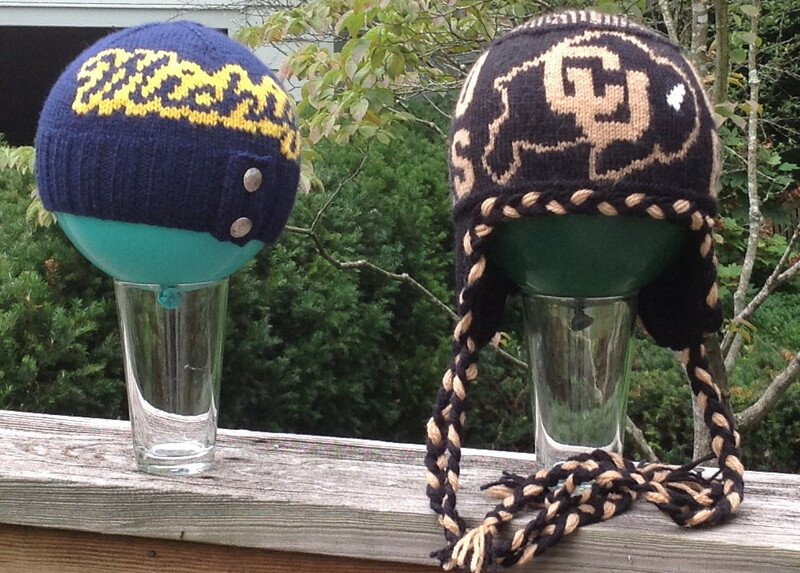 Here are the hats blocking. I've started a short row garter stitch skirt for me using Kauni but I haven't photographed it yet. I will next week. I love the U of M hat! Where did you get the pattern?